There are two kinds of reef keepers, those who have had algae problems and those who will. Controlling algae growth is one of the challenges that virtually every reef keeper faces at one time or another. One reason is that nutrients tend to accumulate in a reef tank, and one of the most opportunistic organisms that can use those nutrients is algae. One key nutrient for algae is phosphate. Phosphate is essentially a fertilizer for plants including algae, so controlling phosphate is critically important for controlling algae. Some time ago European hobbyists began using a new approach to phosphate removal. Instead of using aluminum oxides to remove phosphates, they began using ferrous (iron) oxides. 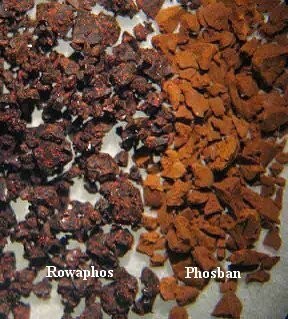 Advocates of iron oxide phosphate removers argue that iron oxide has two primary advantages over aluminum oxide for removing phosphates. First, it can remove a greater proportion of phosphate enabling hobbyists to reduce phosphates to lower levels than they can with aluminum oxide. Secondly, they point out that iron oxide phosphate removers contain no aluminum. The iron oxide based products began appearing on American shelves last year, and initial reports have been very positive. The two best known products available in North America are Two Little Fishes PhosBan and Rowa’s Rowaphos. Both products are iron oxide based, but there are physical differences between the two products. Rowaphos is wet with a caviar- like appearance. The manufacturer recommends keeping the material moist and the container tightly closed. Phosban particles appear similar from a distance, but under the microscope look quite different (figure1). It ships dry and there are no cautions about its storage. Both materials are quite fine and can end up dispersed in the tank if a hobbyist is careless in securing the media. Fortunately both products include filter bags to contain the media. Recommended dosage differ somewhat. Rowaphos recommendations are based on volume. They recommend 2 milliliter per gallon of saltwater. In contrast, Phosban recommendations are based on weight. They recommend 1 gram for each gallon of water. I paid about the same for one hundred milliliters of Rowaphos and 150 grams of Phosban, so using the respective company’s recommendations, the smallest package of Rowaphos will treat 50 gallons while Phosban will treat three times that volume. 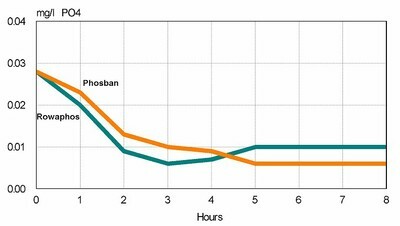 To test the effectiveness of Phosban and Rowaphos, I used both products on small test tanks filled with water from mature heavily fed reef tanks. One test run used water from a tank with orthophosphate levels that could only be detected using a spectrophotometer. The second run used water from a tank with levels easily detected by a hobbyist test kit like Salifert. The test tanks held a little over two gallons of tank water. Five grams of each media were sandwiched within filter media and placed in Marineland Duetto internal filters. Orthophosphate levels were measured using a Hach DR4000 Spectroradiometer. Phosphate levels were measured at the start and then hourly until levels failed to decline further, generally about seven to eight hours. The bottom line is that both products work, and using similar quantities of material work similarly. Figure 2 shows the results. Each product reduced phosphate very quickly and ultimately lowered levels by two thirds. At these levels, phosphate was undetectable (to my eyes) by the Salifert test kit and at the detection limit of the spectroradiometer. The second run began with phosphate levels twice as high as the first run. Again, the products performed similarly (data not shown). Orthophosphate levels dropped to less than 0.02 mg/l, which while 50% less than initial levels is still higher than recommended. This suggests that the media was exhausted. Some hobbyists have reported problems with the iron oxide based products. Hobbyists have reported a reduction in pH while using the products, and in a few cases the bleaching of stony corals. If the observed decline in pH is reflecting a decline in alkalinity, this may mean that oxides are precipitating some component of the reef tank’s buffering system. A rapid change in alkalinity has been linked to bleaching in reef tanks. To examine this issue, a third test was devised. Water from the reef tank with high phosphates and an alkalinity of 7 dKh was divided between three test tanks. Water in one tank was simply circulated using a small powerhead. The second tank was filtered using 5gm of Rowaphos in a Marineland Duetto. The third tank also had 5gm of Rowaphos in a Marineland Duetto. However, to this tank I added a small amount of ESV B-Ionic to increase alkalinity to nearly16 dKh. 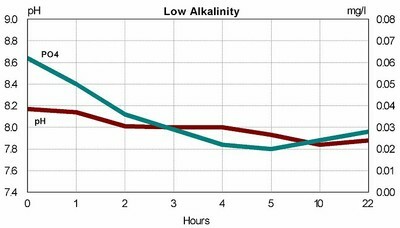 This would tell us whether elevated alkalinity had any impact on the results. I monitored pH and phosphate over the next 22 hours. The pH in the tank with no Rowaphos dropped slightly over the 22 hours, from 8.19 to 8.09. As figures 3 and 4 show, pH dropped for both tanks with Rowaphos. 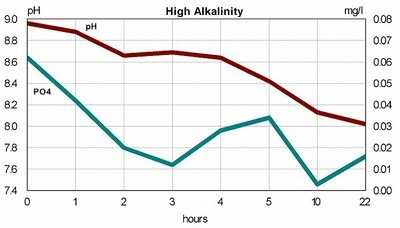 The tank with elevated pH and alkalinity dropped the furthest, nearly one pH unit. In contrast, the tank with lower initial pH dropped only 0.2 units. The tank with alkalinity of 7 dKH at the beginning of the run was still 7 dKH at the end. In contrast, the tank with alkalinity of 16 dKH declined to 11 by the end of the run. While further study is necessary to draw definitive conclusions, the super-saturated state that some hobbyists operate their tanks may account for the problems reported. Regardless of the explanation, a hobbyist using iron oxide based phosphate removers should be aware of the potential decline of pH and plan accordingly. In summary, iron oxide based phosphate removers are effective at lowering phosphate levels in a reef tank and can reduce them to natural seawater levels. There appears to be little difference in effectiveness of the two leading brands, so one can use either depending on price and availability.